I've exulted about Yayoi Kusama many times over the years (here, here, and here), most recently when I created a dress inspired by her Pumpkin at the Hirshhorn Museum and Sculpture Garden. Pumpkin was a precursor to her exhibition, Infinity Mirrors, which opened today at the museum in Washington, DC. 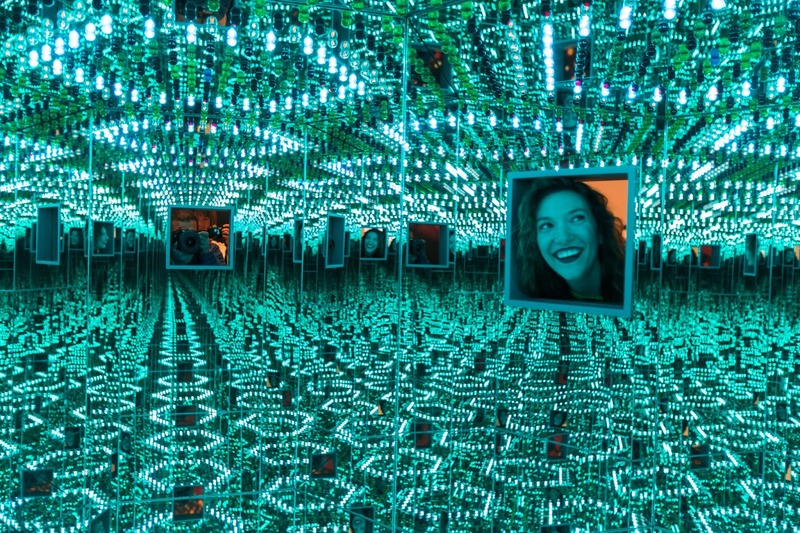 I had the pleasure of touring the exhibition along with the press, and got to spend time in each of her otherworldly infinity rooms with my old friend Rosh, who had agreed to take photos. 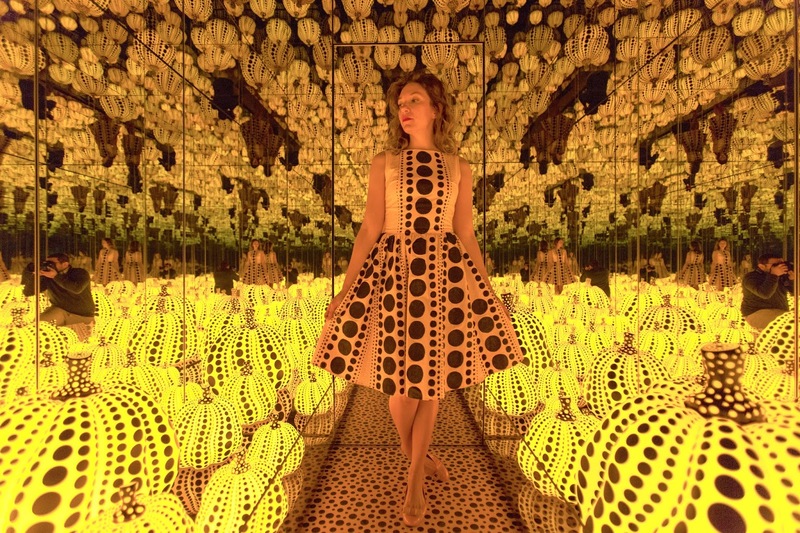 For the occasion, I made another outfit: this spotted jumpsuit inspired by Infinity Mirror Room - Phalli's Field (1965-66). To my astonishment, another museum-goer, Deane Madsen, also dressed in red polka dots! Matching other art lovers is becoming more and more common (as evidenced in my last post, from LACMA). 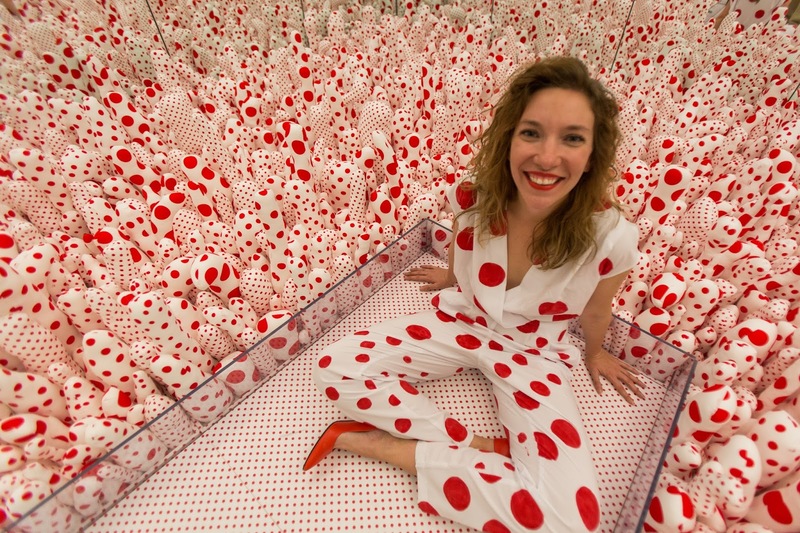 I love that more people are using clothing as a way to express their love for art! 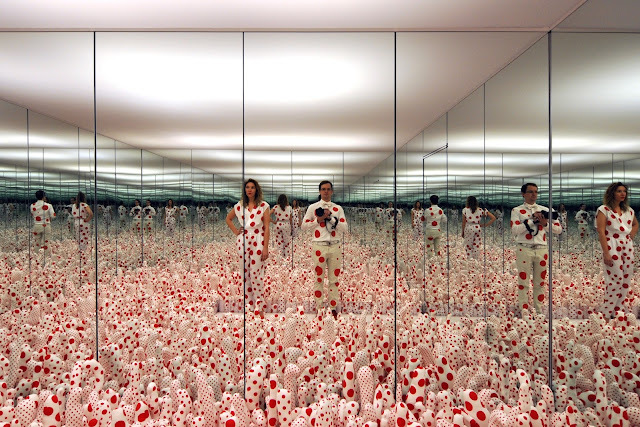 Yayoi Kusama: Infinity Mirrors is open at the Hirshhorn Museum and Sculpture Garden through May 14, 2017. Photos by Roshan Patel and Deane Madsen. My love of Henri Matisse has been a constant throughout most of my life, and my own work has been inspired by his many times. 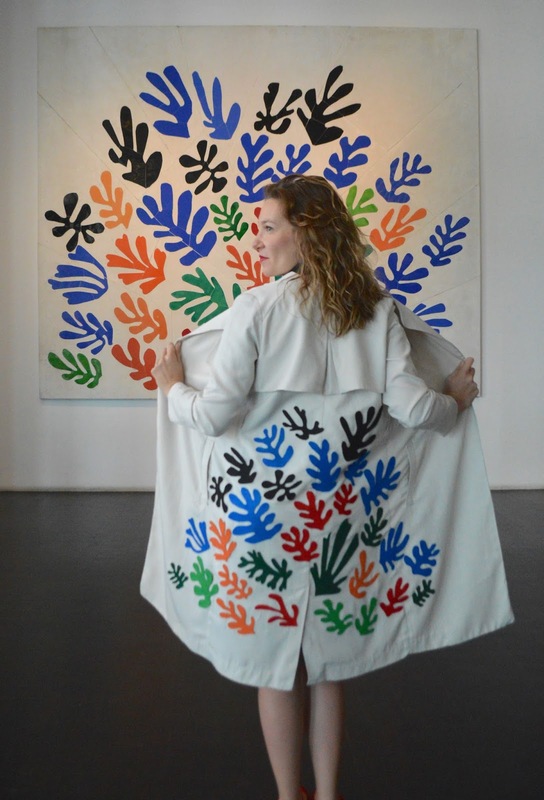 However, it wasn’t until last year that I gained the courage to create a garment inspired by one of my favorite Matisse works: La Gerbe. It was surprisingly intimidating to embark on a project inspired by an artist and a work that I so greatly revered. I spent months visualizing how I would portray my own interpretation of La Gerbe, and the entire process, from conception through creation, lasted about six months. 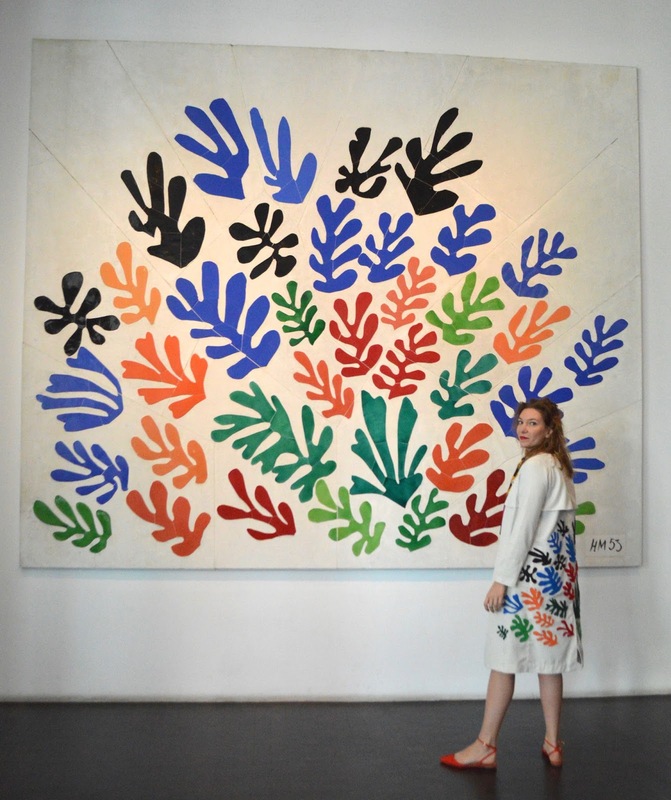 Over the weekend, the two finally came together at the Los Angeles County Museum of Art. 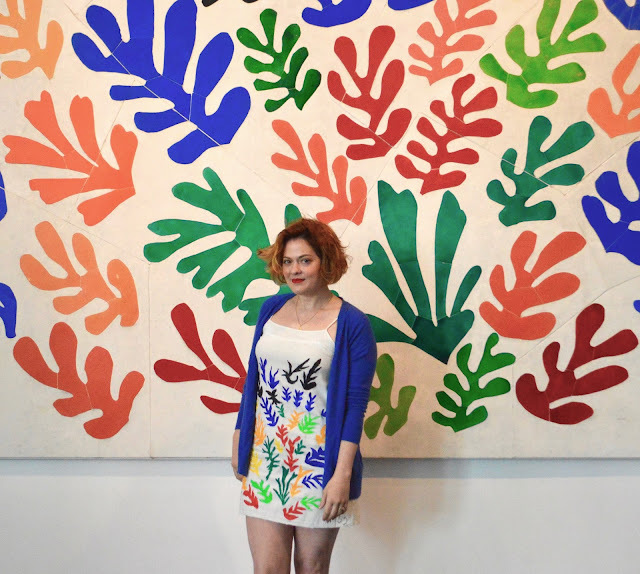 I planned to meet an old art school friend, Rose Lawrence, at the museum, and I waited for her outside in the LA sunshine, wearing my masterpiece jacket. 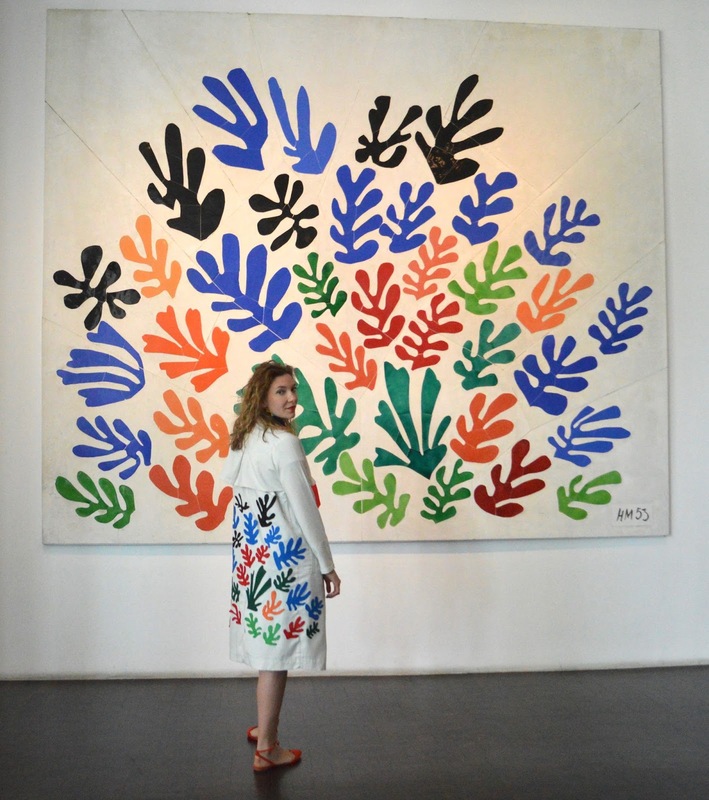 When I saw her approaching from a distance, I couldn’t believe my eyes – she was wearing a hand-painted dress she had made, inspired by La Gerbe! I was overwhelmed and incredulous. After hugging and laughing and hugging again, we went inside to meet our match, arm in arm. I can hardly describe how much joy it brought me to bask in the presence of La Gerbe along with another kindred spirit. 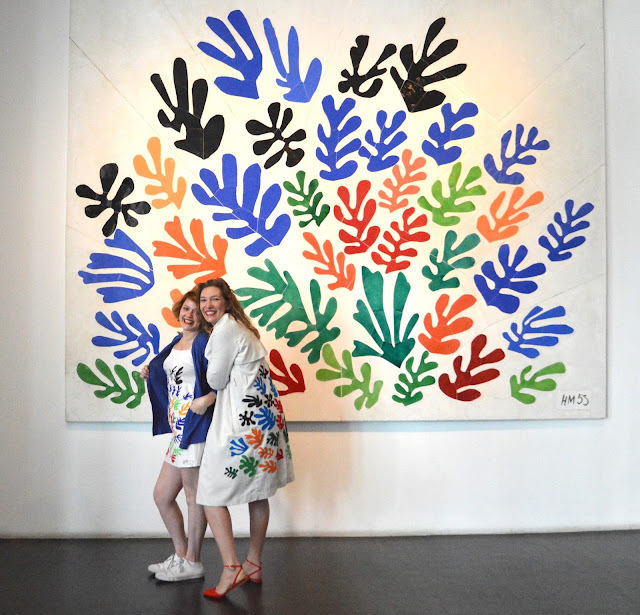 It was like three generations coming together – La Gerbe, my jacket inspired by the piece, and Rose’s dress inspired by my jacket inspired by La Gerbe. 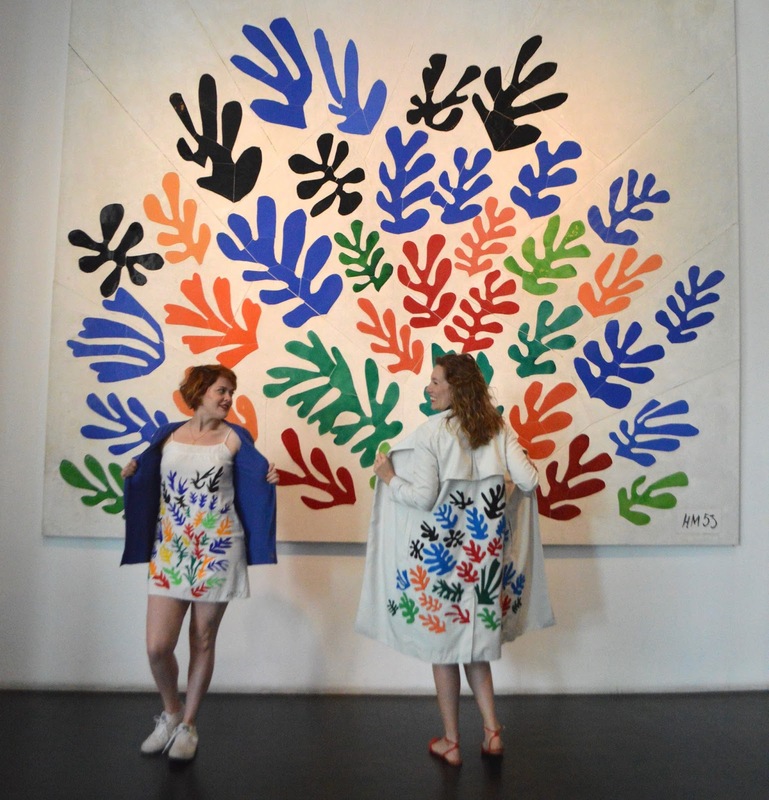 It was fun to see the museumgoers’ reactions to our outfits in front of the grand artwork, and to answer questions about how we made our respective garments. 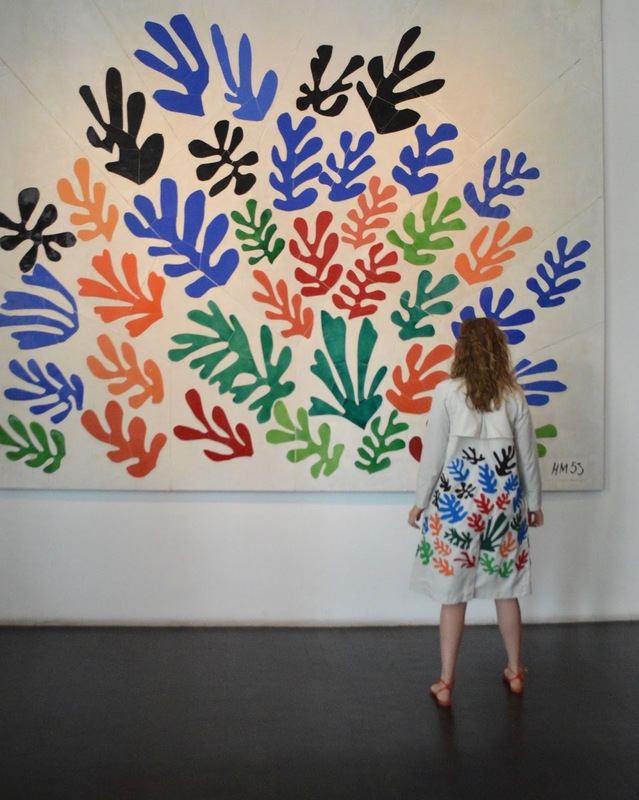 In my study of Matisse, I’ve found that I relate to many of his artistic sensibilities, have experienced some of the same struggles, and am working toward many of the same goals. I uncovered a similar affinity when reconnecting with Rose, an entrepreneur and creative genius in her own way. Not only did I learn that she valued and connected with my artistic passion, but that we also experienced many of the same challenges and triumphs in our respective endeavors. 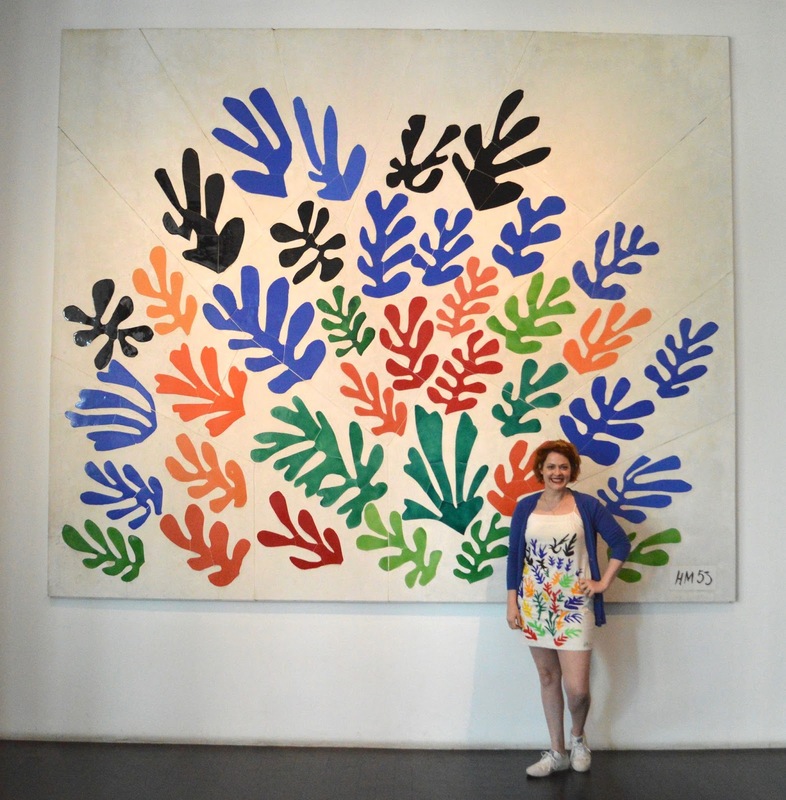 Matisse said that, “Another word for creativity is courage”, and this truth has revealed itself more and more to me. As I continue to pursue my artistic endeavors and understand and appreciate more deeply the passions of my friends, I've learned that it takes not only courage, but endurance and determination to follow your passion, and I believe Matisse would be glad that we did. Photos by myself, Rose Lawrence, and Myra Hassaram. You can find Rose's fabulous company Red Bread here.